When I shoot during sunrises and sunsets I usually pay closest attention to the colors and expose for the sky. Bringing out those rare colors and cloud shapes can be a challenge and certainly makes for some beautiful photos. However, over the last year I've also grown to appreciate the structure, contrasts, and unique shapes that emerge from the environment when the light is coming at such a low angle. Regardless of colors, shooting for a longer exposure can bring a scene to life in a way that our eyes don't immediately see. That's exactly what I found at this location. 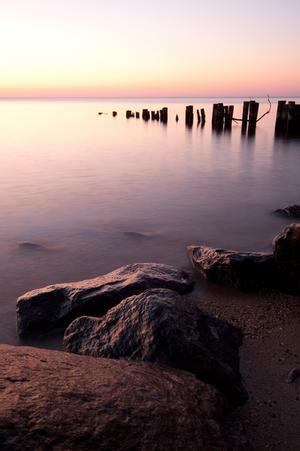 I was shooting sunrise in North Beach, MD along the shore of the Chesapeake Bay. The day was still so young and there wasn't much ambient light. I initially shot for the sky and was coming in around 4-5 seconds. The shots were very close to what my eyes perceived but the structure of the rocks and the shape of the decayed pier just didn't want to play ball. Rather than give up I just upped the exposure to 8-10 seconds knowing I'd start to blow out the sky and the reflections. I know it's all in the eye of the beholder, but I was pleasantly surprised how much better I liked the overexposed shots than the darker ones I took. Feeling down on the shots you've got? Take double the exposure and call me in the morning.